Note: Parts of this documentation were created by Peter Koch / IBK Software AG. Peter Koch has licensed this content for use on contoawiki.org. Content in this page must not be copied, reproduced, republished, uploaded, posted, transmitted, distributed, or used for the creation of derivative works without IBK's prior written consent. Native Contao application; fully integrated into Contao user/member system. Can be used as forum, as helpdesk ticketing system, or both at same time. Both, frontend members and backend users, can be members/clients or moderators/supporters. 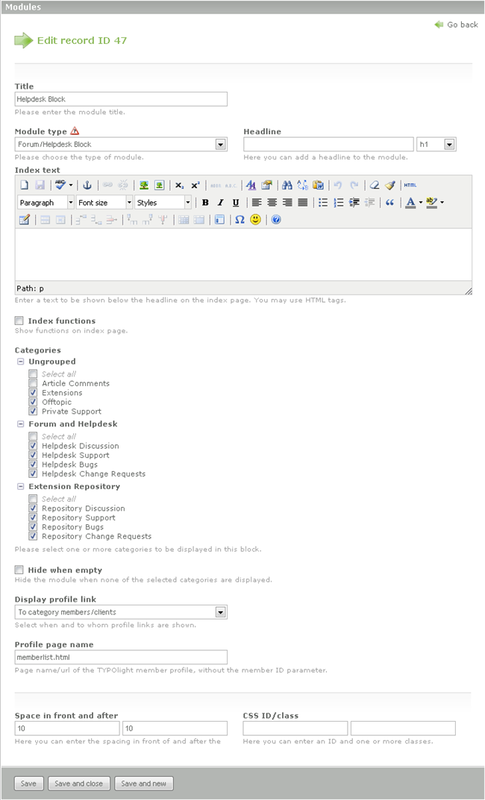 Multiple frontend modules with selected categories are possible; to be displayed on one or several pages, or embedded within articles. Backend modules for configuration and forum participation. Comprehensive and fast BBCode engine including tables, lists, several box types, syntax highlighting and more. Popup windows for BBCode help and editor preview. Email notification to subscribing users. Email import to create new topics/tickets, as well as to reply to notifications. Fully customizable layout and appearence by templates and themes. RSS feeds for any selection of categories. Public Forum: Everybody can read the forum, even non-logged in users. Only authorized members can however open topics or reply. Restricted Forum: The forum is visible only for authorized members. Public Support: Everybody can see all tickets, even non-logged in users. Only authorized clients can however open tickets or reply. Shared Support: All authorized clients can see and reply each others tickets, however only the owner has priviledge to close or delete his tickets. Create such a category for example for each company with a SLA((Service level agreement)) where multiple staff members shall have access to the tickets. Private Support: Only the ticket owner can see his tickets, but nobody else (admins and supporters authorized for the category can of course also see and reply to the tickets). Used for example for formal support of individuals. Pinned up: Open topic that is listed on the top. Normal: A normal open topic. Closed: No further edits or replies are possible, listed at the end. Unanswered: The ticked is open and the latest post is from a client. Listed on the top. Answered: The ticket is open and the latest post is from a supporter. Closed: Issue solved. No further edits or replies are possible, the owner may reopen it however in case. Listed at the end. 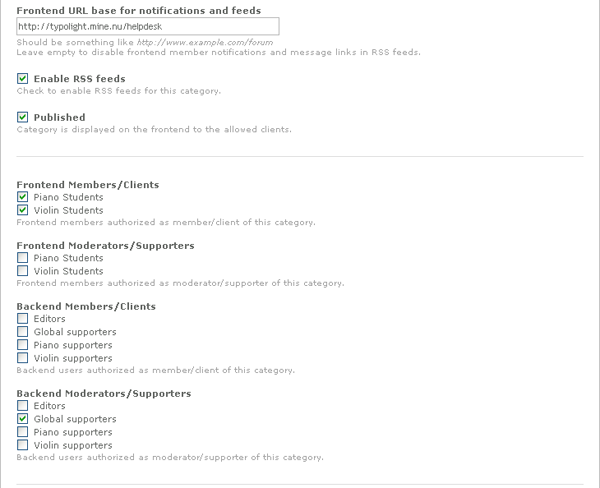 Forum members and support clients are either "frontend members" or "backend users" in terms of TYPOlight, and belong to a member/user group authorized for the respective category. The client opening a ticket has special "owner" rights in the support type categories: He has authorization to close or delete (5) his tickets. 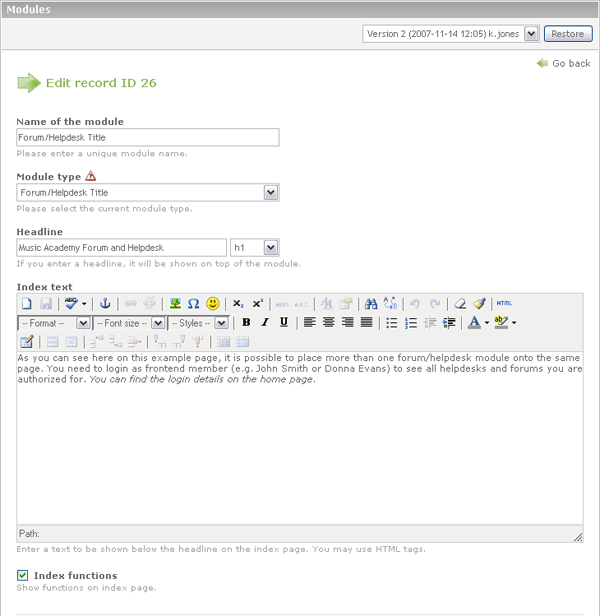 Moderators and supporters are either Contao backend users or frontend members, and belong to a user group authorized as moderator/supporter for the respective category. They have special rights to see unpublished, to pinup, edit, unpublish or delete any topic, ticket or message. Contao admins are special backend users and appear as moderator or supporter, he/she is automaticly authorized for all categories. Additionally the admins have authorization to administrative operations, e.g. create or delete categories or change category settings. Also admins are the only ones who can see unpublished categories. Tickets and messages are not permanently deleted, but only unpublished from frontend when a ticket owner or member/client "deletes" them. They are still available for moderators and supporters however, mainly to serve as a knowledge resource. 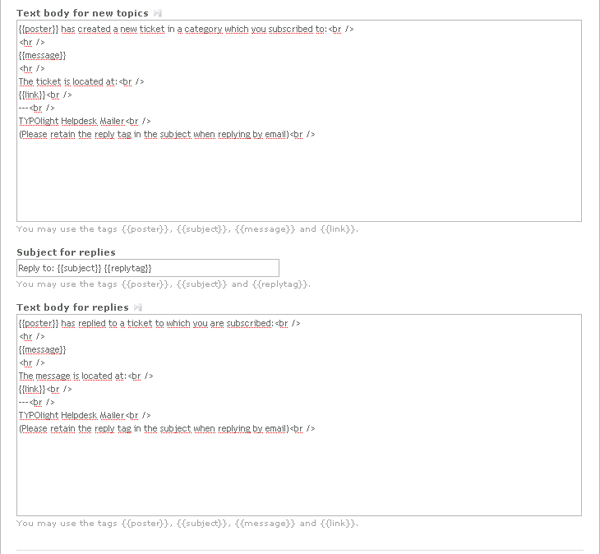 Tickets and messages can be permanently deleted only by admins, moderators and supporters. Download the install package from . Unzip the content of TL_ROOT to the Contao base directory on your webserver. Unzip the content of TL_FILES to the tl_files directory on your webserver. The module will also work without this, however it will look poor in the frontend. 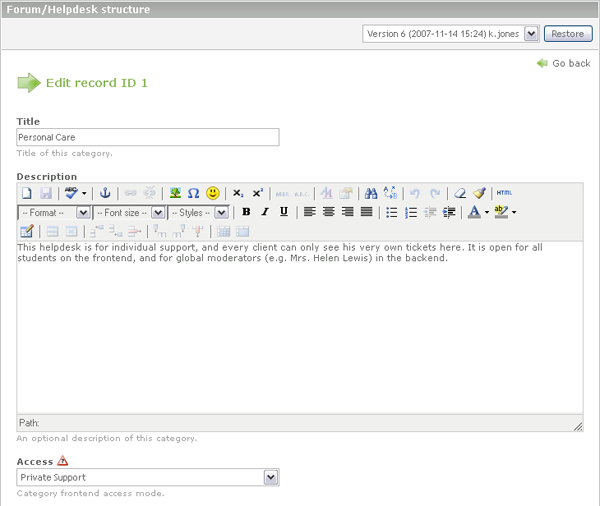 Go to Page layouts and change the layout for the pages that will display the forum/helpdesk. 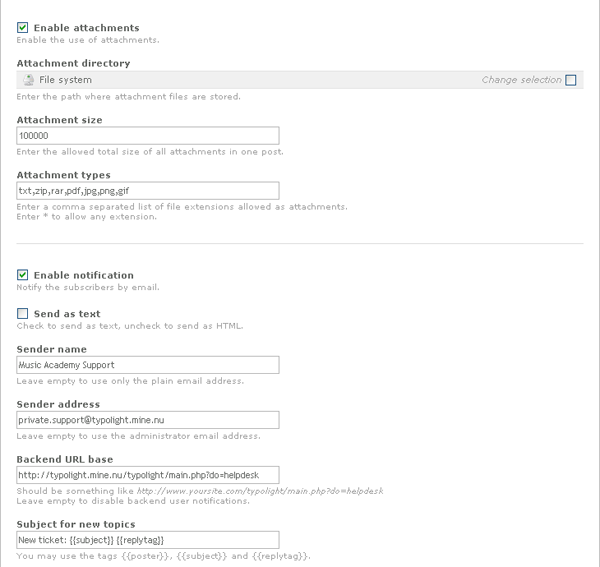 This might be a special layout you make for the forum/helpdesk pages, or the Default layout. To create the theme mysite you would first of cause create a new Contao backend theme folder /system/themes/mysite and activate it in in the Settings. Then likewise you would create a folder system/modules/helpdesk/themes/mysite, copy the CSS files from the adjaccent default folder and make your adjustments to them. Please note that because of the automatic fallback it is not necessary to copy all the images from the default theme. In case you want your own icons, just create a subfolder images and put them in there; any icons not found there will be taken from the default theme. Copy the CSS files from system/modules/helpdesk/themes/default to your custom frontend theme folder and make the desired adjustments. Don't forget to adjust the Page layout as explained before to use your custom stylesheet instead of the default one. You may want to replace some or all of the default forum/helpdesk icons too. Just put your custom icons into an images folder below your custom theme. Then enter the path of your images folder in the helpdesk settings. Again there is a fallback built in, so any icon not found in your custom images folder will be taken from the default backend theme. Instead of PNG you may use GIF icons. In case both, a GIF and a PNG icon is found, the PNG has precedence. In case you need to customize the default templates, just copy the files of interest from /system/modules/helpdesk/templates to /templates and make your adjustments. Please note that the template files are used for both, frontend //and// backend. Note: As of TYPOlight 2.5.0 it is no longer required to edit the file ModulePersonalData.php; the hook is now included in the core file. However you still need to select the template member_grouped_helpdesk up to 2.5.9. Since TYPOlight 2.6.0 you also no longer need member_grouped_helpdesk because all necessary changes got included in member_grouped. You may want to give your frontend members the option to subscribe themself for email noification with the Personal data module. This will work right out of the box when you are using the template member_default. Finally, go to the Personal data module and select the template member_grouped_helpdesk. To send out notifications and import email a batch program must run on a regular base. You need to install the cron utility for this purpose. Below you find suggested settings for the two Forum/Helpdesk jobs. Use a time schedule that matches your needs; the samples below will execute once every minute. Check if your servers are properly configured to send out mails by creating a test-newsletter and sending it to one of your mail accounts. Send it to another server than the one used for sending out the mail to make sure the mail is not getting caught in some spamfilters or lost in any black hole. Using PHP Mail may work on well configured servers (which is not selve-evident these days, cheepo hosters are greeting). Use SMTP in case, that will work 100%. A common mistake is to use a different domain in the notification sender address than in the mail account in the system settings. For example when your SMTP account in the system settings is admin@example.com, a notification sender address such as forum@banana.net is likely to fail because that would be "relaying" which is forbidden in well configured mail servers. Of cause there are exceptions from this rule, for example when the mail server is configured to handle both of those domains. Leave the notification sender address empty until notification works in case. 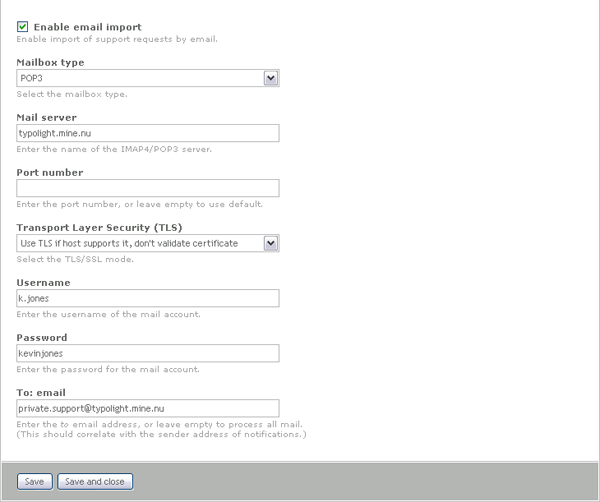 Switch the helpdesk logging to "debug" in the Contao system settings. You will find the log files at /system/logs/Helpdesk*.log. In case no log file gets created during the batch run, your directory permissions of /system/logs does not allow write access for the web server. In that case you can manually create the two files /system/logs/HelpdeskImport.log and /system/logs/HelpdeskNotify.log and give them read/write permissions for the web server (for example as chmod of 666). You will most likely just see a blank page when executing, but then check the log files after execution to see the results. Caution: It is recommended to make backups of your files and your database before starting any upgrade. You can upgrade directly from any previous release, it is not necessary to install every version that was released between your old and new version of the application. Caution: Do NOT delete the mysql tables and settings of the helpdesk application after removing the old files, neither with phpmyadmin nor by using the Contao install tool. Otherwise you will loose all your data and settings. Unzip/upload to your Contao base directory on your webserver. If any drops of obsolete table columns are due, they are by default unchecked. It is safe to check them now in order to have clean database. Click on Update database to have the necessary database updates applied. Note: After upgrading, you should read the change log to see what has changed and might need your attention. Full text search of mysql will by default not find any words shorter than 4 characters, or in the stopword list. To improve search I recommend to lower the minimum word length to 2, or even down to 1. In case your site is not english only, you might also want to disable the default stopword list (or apply []). Well this section is currently very brief. Only a few screenschots so far, but I guess you will figure out usage yourself with some Contao experience. Basicly a title module is not required, however it helps you structure your forums and helpdesks when you want to group the categories into blocks. This page was last modified on 8 March 2012, at 02:14.